If Braid was the little kid in class who loved to draw beautiful pictures but was cleverly obnoxious to no end, Jonathan Blow’s newest game would probably be the new foreign exchange student. You’ll understand little of what The Witness is saying at first, and it’s a sure bet that you’ll be annoyed, trying to comprehend its unique gestures and language. You’ll come to a point where you’ll think you’ve got it all figured out and might even start a rudimentary conversation, only to discover there’s a whole lot more you don’t know about it and are dying to find out. This time, there’s no poetic intro. The Witness is strictly to the point. As soon as you load in, you’re dropped in a dark corridor, in first person, with no explanations whatsoever. Upon completing a couple of simple line puzzles that teach you the basics, aside from movement, you’re given free range to explore the game’s expansive and colorful world at your leisure. Not all areas are totally opened up at the start, though, requiring you to solve some puzzles before seeing all they have to offer. Spoiler! This is a lake. 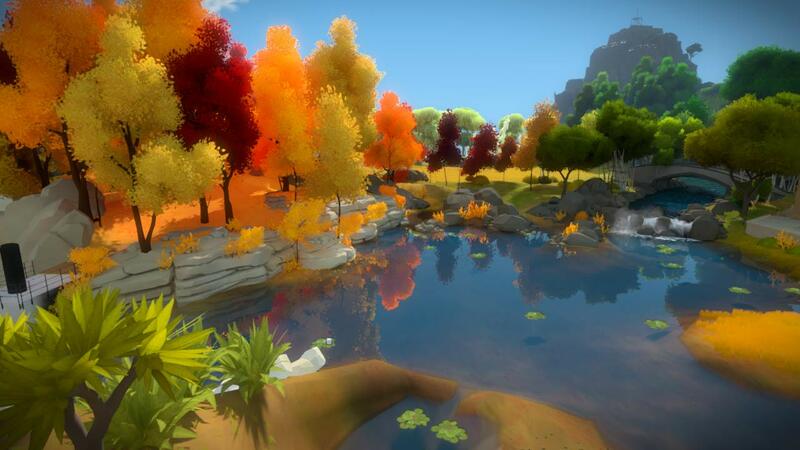 While there’s seemingly no set path to follow when playing The Witness, a progression logic quickly becomes apparent. There’s an astounding amount of variety to the seemingly limited line maze puzzle set upon a grid. With each new area, you start learning new rules that make things hairier; new concepts applied to the core design that eventually combine and become ever more complex the further you get in the game. These aren’t just limited to visible elements, either. To keep this from spoiling a few surprises, it’s safe to say that The Witness makes brilliant use of your senses, or at least the ones that technology currently allows you to program for. The great part about this game is that there’s no universal trick to figuring out solutions. Having patience and a careful eye are as paramount as they’ve ever been, and puzzles are unpredictable in difficulty. For every section of easy solving, straight dashing puzzles, there are multiple panels that look unsolvable at first glance. Most of these require you to step out of any comfort zone you might have gotten yourself snuggling in at that point in order to feel things differently. For instance, you’ll run into grids that look empty when approached straight ahead, only for you to find a specific angle with which a solution becomes clearer, or sometimeseven presents itself elsewhere. Clues are in the most unexpected of places in The Witness, though sometimes they’re not as literal as you’d expect. There will even be moments when you’ll probably want to pull out a scrap of paper in order to doodle, or even snap a picture and muck with it on your computer, in search of a solution. Anything but looking up an answer online goes, and The Witness throws so much at you that figuring puzzles on your own is extremely satisfying and rewarding. If you do get stuck though, as with any problem, give it time. Some of puzzle concepts won’t settle in your brain as well as others, which is only natural, but trust me, you will want to solve everything in this game based on your own pace and effort. There’s a lot to explore in this island. Puzzle games that require more than just straight puzzle solving aren’t anything new at this point, with absolutely sublime examples such as The Talos Principle, which forced you to think in multiple dimensions, as well as serving as a fantastic story delivery tool that put you in the director’s chair for how the world’s lore progressed. The Witness isn’t nearly as literal as Talos, though, and requires a little more of your part before it’ll spill its beans, or at least give you the minimal amount of clues for you to put together some sort of background as to what exactly is going on. There are, however, a few recordings scattered on the island that go on about a lot of apparently unrelated subjects, aside from the visual cues you’ll run into that are carved in the world design. There’s no invitation to delving into these bits, and you can safely “finish” the game without ever seeing or hearing anything that even resembles a story. That is, unless you come up with your own harrowing tale of dots and symbols — I won’t judge you if you do. I totally did so myself. For as much as anyone could argue that Jonathan Blow’s public outcry against traditional game design sometimes comes off as being antagonistic just for the sake of publicity, given he’s been given support and a spotlight by more than one of the biggest companies in the videogaming industry, there’s no denying that his games are quite unique. 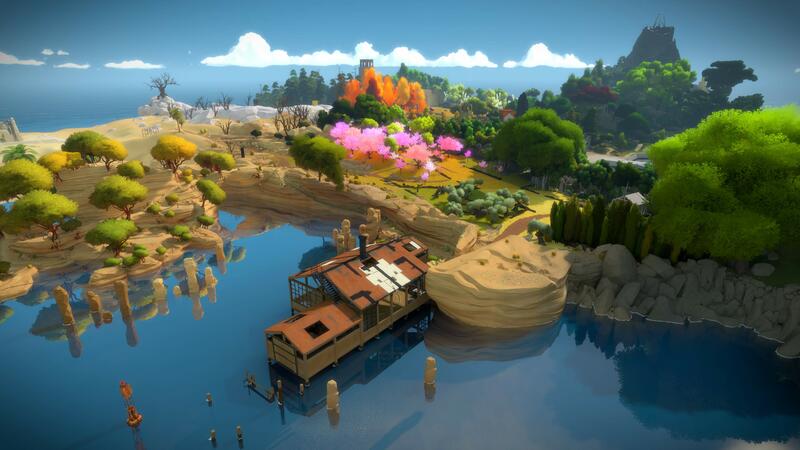 Although it doesn’t go on in the same aggravatingly in your face about how clever it is like Braid did, The Witness manages to take things one step above, without having to resort to talking down to anyone. The Witness a great puzzler. Figure in the many layers of hidden bonuses on top of the crap ton of brilliantly designed content, you’ll surely be kept busy for hours upon hours. It’s totally worth the price of admission. You should most definitely see what this one’s all about.